On the face of it, the United Nations Security Council Resolution adopted on Dec. 23, 2016 on Israel and the Palestinian Territories has merit, reflected in the 14-0 vote in its favour, with the U.S. abstaining. After all, the Palestinians have been living under Israeli administration since the defeat of the Arab armies in the 1967 war. Even though the impasse has partly been the fault of the Arab world's intransigence, to the ordinary Palestinians, life under Israeli occupation shows no sign of ending. But there was more to the UN resolution than meets the eye. The target, it seems, was not Israel but US President-elect Donald Trump. The expulsion of Russian diplomats from America and new sanctions on Moscow are further indications that outgoing President Barack Obama has descended into unprecedented pettiness to embroil his successor in untangling messes he is creating. Obama has descended into unprecedented pettiness to embroil his successor in untangling messes. Coming back to the Security Council vote against Israel, Prime Minister Benjamin Netanyahu made no secret of his contempt for the Obama administration. His spokesman, David Keyes, told CNN Israel has "iron-clad" information that the Obama administration was behind the Security Council resolution condemning Israel and that, "not only was the resolution crafted by the Obama administration, it was pushed heavily by it." The most controversial part of the resolution concerning Israeli settlements in the West Bank was the reference to East Jerusalem as occupied territory, a city that Israel considers its capital, and has vowed to never let fall to non-Jewish sovereignty. For thousands of years Jews have prayed at the Western Wall and the Temple in East Jerusalem, on top of which invading Arabs built the Al-Aqsa Mosque and the Dome on the Rock in the 7th and 8th centuries. It is from here that we Muslims believe Prophet Muhammad ascended to the heavens to meet the divine and the Abrahamic prophets that preceded him. But the fact is, in all of Islam's nearly 1,500-year political history, the city of Jerusalem has not once been accorded the dignity of being the capital of any Islamic empire or caliphate. Not for the Medina-based "Rightly Guided Caliphs" of the 7th century; the Umayyad dynasty of 8th century Damascus; the Egyptian Shia Fatimids of Cairo in the 10th century; the Arab Sunni Abbasids of Baghdad, who ruled until 1258, or the Ottomans of Istanbul from the 15th to 20th century. Asking Israel to concede the Temple Mount is like asking Muslims to give up the Kaaba in Mecca. To ask Israel to give up control of the Temple Mount is equivalent to asking Muslims to give up the Kaaba in Mecca, or for Sikhs to abandon the Golden Temple in Amritsar. 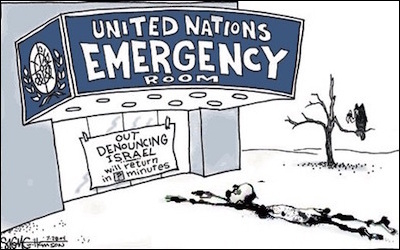 It is in Israel's own interest that the world sees it ending what the UN says is "occupation". There must be clearly defined borders that ensure the Jewish state's security while the Palestinians have a contiguous country of their own. As for the UN and its hypocritical moaning over Jewish settlements, perhaps it may want to look beyond its historic anti-Semitism and stop Moroccan settlements in occupied Western Sahara, end Indonesia's occupation of West Papua, and take Pakistan to task for building Chinese settlements in occupied Balochistan.